This blog is devoted to the work I create when I just need to cut loose and have a little fun. Some of the pieces below are paintings and some are mixed media assemblages. Prints are available of all of the paintings. Please contact me at lorikgordon@gmail.com for prices and availability of both originals and prints. For my more serious work, please visit my other sites at thekatrinacollectionbylorikgordon.blogspot.com, gordonmixedmedia.blogspot.com, and sixdegreeswesttoeast.blogspot.com. 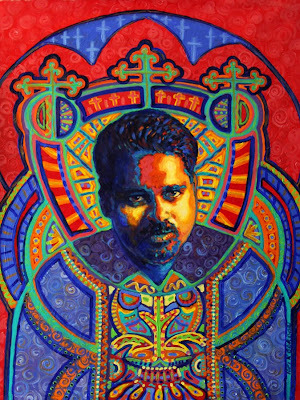 Father Sebastian 18" x 24"
I have portrayed Father Sebastian of St Rose de Lima Church in Bay St Louis in front of a stained glass window which features a medieval symbol of the Holy Trinity. The lines of the design were allowed to run into his vestments, becoming a part of his portrait. I incorporated three St Thomas crosses in the design to honor his birthplace and childhood influences in southern India. The richly textured chasuble he wears was styled after one which his parishioners have seen him wear. Both chasuble and the background point to the opulent fabrics of priestly vestments. The colors of the painting are those which have symbolic meaning for the church; red is symbolic of the holy blood of Jesus; green denotes the hope of eternal life; violet symbolizes sorrow and penance; gold denotes majesty and splendor; rose indicates joy. The Father has an intense gaze which indicates the depth of his faith. The strong directional light illuminates the man of God known and loved by so many people in his community; the side of his face that is in deep shadow hints at the man from a different culture, a mystery whom we will never really know. 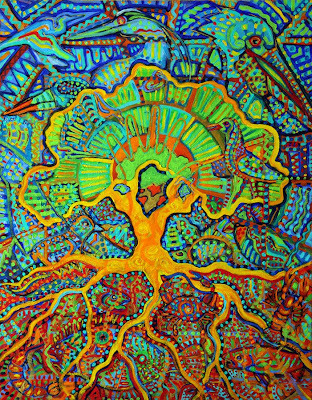 "New Day" is a 22" x 28" acrylic painting on gallery wrap canvas. I created this piece for a local celebration in Bay St Louis, which is planned for the third year anniversary of Hurricane Katrina. All of us here on the coast wanted to mark this anniversary in a special way; we are excited about our future, and gladdened by the progress we have made in our recovery. When the call for new art came out, I decided that I wanted to concentrate on the incredible beauty of our natural environment. I began with the two oak trees, which point to our abundance of plant life in this semi-tropical setting. I then added land, air and sea creatures. I indicated that the human touch upon our world should be light, as indicated by the almost invisible hand print. I am attempting to get children involved by having a contest for kids 10 and under; the first child who can find all of the critters will win a framed print of the painting for their room.